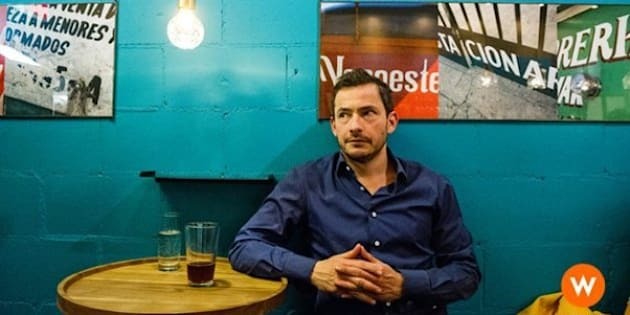 TORONTO - Eating a hotdog with Mayor Rob Ford was just one of British restaurant critic Giles Coren's foodie experiences during a visit to Toronto. Another was noshing on crickets. While in the city to film "Million Dollar Critic" last spring, Coren interviewed Ford about the food truck legislation that had passed the day before. "When I said let's go get a hotdog across the square I didn't think he would say yes because there was a yammering pack (of media) because he'd just done his crazy drunk stuff on St. Patrick's Day and I thought he'd go by the back door and we went out to get dogs and we were surrounded. And he clearly enjoyed showing the press who was boss, or who he feels was boss." The acerbic Coren, a former political columnist who pens restaurant reviews for the Times and has also worked for such newspapers as the Daily Telegraph, Daily Mail and The Independent, said laughingly that Ford didn't eat a hotdog "because he's got to stay in shape." "I had one although I only ate the sausage from the middle of the bun. Marvellous though Rob is, I don't want to end up that big and the way that I do that is by not eating carbohydrates too much." The bread basket is "never the place where the chef reveals his genius anyway." In "Million Dollar Critic," which premieres Tuesday at 10 p.m. on W, Coren visits three cities in Canada (Toronto, Quebec City, St. John's, N.L.) and three in the U.S. (Philadelphia, Providence, R.I., and Charleston, S.C.), where he explores up-and-coming, authentic and established restaurants, diners and food trucks. In each locale, he visits five restaurants and bestows one with a review. In Toronto, he checks out Opus, King Palace, Small Town Food Co., Agave y Aguacate and The Atlantic. In St. John's, the restaurants are Saltwater, Chinched Bistro, Raymond's, The Reluctant Chef and Bacalao, while his Quebec City stint includes Hosaka-Ya, L'affaire Est Ketchup, Soupe & Cie, Panache and La Traite. He says he liked four of the five restaurants in Toronto, though eating crickets at one was a challenge. Coren says he'd rather do a show like "Million Dollar Critic" because it looks at food from an anthropological point of view. "It's fun because the show is not about food. It's about restaurants and life and it's like the kind of columns that I write. It's about the life that goes on in restaurants and a bit about chefs. "I'm more interested in waiters and waitresses probably than chefs because they're usually more different with a more diverse background and go on to do different things. Chefs are just hardworking, obsessed, crazy people." He hopes viewers will become involved in the stories of the five restaurants that are in contention in each city and what it could mean to them to get a review in the local paper. "It makes the restaurant," the outspoken critic says. "That's the thing that Trip Advisor cannot do or a food blogger cannot do. Only someone with a huge following can make that kind of difference." The TV coverage is a bonus, he adds. "I had no idea. Blown away by both of them. Quebec is a crazy place. I knew they could speak French there. I didn't know they actually did. To find this kind of European 400-year-old walled city full of cute French chicks and fantastic restaurants. A bit too cold for me, but then you want to be inside eating. "And Toronto is just diverse and exciting and better than almost any restaurants, as good as New York, which I know Canada doesn't want to be compared to America, but like New York except everyone is a tiny bit nicer and when they've finished building it it will be great. I haven't had a meal where I wasn't sitting under a crane." When Coren started in journalism, the Internet was in its infancy, but he notes it has now shaken up restaurant reviewing. "The idiots get it all out of their system — what's new, what's hot, whatever, the tables get booked up — and then we go in and, I think, offer an opinion. It's not more valid, but I'm not a blogger with nine people reading my thing. "I write for a newspaper with a million readers and I have 150,000 (Twitter) followers and a TV show so my opinion is in the end going to make more difference so I have to be a bit careful about it and my reputation is based upon not only finding interesting restaurants but writing a piece that you can get to the end of without putting your fingers down your throat because it's so dull." In "Million Dollar Critic," Coren hopes to shine a spotlight on Canadian cuisine through his British eyes. "I think the positive thing about this show about me being British and coming here is that Canada always feels to me like a piece of Europe on the North American continent and I have nothing in common with Americans. And although I'm going to go there and film some shows I find the whole place terrifying and weird and I don't understand why they eat so much processed cheese," he says. "Million Dollar Critic" airs after another new W offering, "Pressure Cooker," which illustrates the pressures of cooking at home when time is tight and ingredients are scarce, pitting skilled home cooks against the clock and each other.